Build Windows Application in GUI Mode. And Easy to Program. and enables the rapid application development (RAD) of graphical user interface (GUI) applications, access to databases using Data Access Objects, Remote Data Objects, or ActiveX Data Objects, and creation of ActiveX controls and objects. 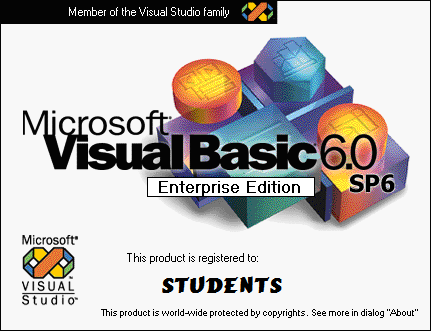 Scripting languages such as VBA and VBScript are syntactically similar to Visual Basic, but perform differently. A programmer can put together an application using the components provided with Visual Basic itself. Programs written in Visual Basic can also use the Windows API, but doing so requires external function declarations. Though the program has received criticism for its perceived faults, from version 3 Visual Basic was a runaway commercial success, and many companies offered third party controls greatly extending its functionality. If above link was not working, download directly from below. It is compressed and split in 3 parts. Download Android LetterMagic 4 Image 1 Word Game free and get concept to make on Visual Basic 6. Download all parts and extract it by 7Zip. Install it. Run AcmSetup.exe (for Windows 7+ users) to install. Note: Only select VB6 and remove other components such as VC6 or VF6 etc. If setup show some errors, skip/ignore the errors and continue your setup.